Malibu has long held a reputation as being home to movie star residents and a world-class surf break. Lesser known, however, are the area's diverse opportunities to get outside in nature through its network of state and county beaches, parks and trailheads that cover this scenic 21-mile stretch of south-facing coastline nestled between Santa Monica and Oxnard. Backed by the Santa Monica Mountains National Recreation Area, Malibu's coast is one where mountains meet sea, and it's point-studded shores hold some of Southern California's most beautiful beaches. But the exploration doesn't stop there. Throw in a handful of state parks, a few campgrounds and numerous hiking and biking trails exploring both the coast and the Santa Monica Mountains' interior , and you've got yourself a postcard-perfect coastal playground that just so happens to be adjacent to one of the largest cities in the country. Zuma Beach. Photo by Tyson Gillard. Malibu's beaches may be its most treasured natural gems. Indeed, their golden sands and relatively calm waters beckon. While small sections of Malibu's coastal access is limited by private property, there are numerous stretches with public access for all to enjoy Malibu's sandy stretches and more intimate coastal nooks and crannies. Point Dume, a prominent headland jutting out southward into the Pacific, splits the Malibu coast in two. To the east sit the beaches within Santa Monica Bay, generally more protected and sheltered; to the west are beaches more exposed to wind and swell. Surfrider Beach/Malibu Lagoon State Beach: World-renowned surfing point break that draws plenty of surfers when it's on. More often than not it's calm, empty and quiet. Beach is backed by a large lagoon fed by Malibu Creek that's a haven for seabirds. Trails provide access to the beach and opportunities to explore the lagoon. Malibu Pier: Adjacent to Surfrider Beach. Great views and good food options. Dan Blocker State Beach: Mile-long stretch of sand that is easily accessed from Highway 1. Popular with divers. Paradise Cove Beach: Tranquil waters and a beautiful beach, albeit private with fee to access. Cafe offers a scenic place to grab a meal. Point Dume State Beach and Nature Preserve: Scenic headland with trails, a nature preserve, and one of southern California's most picturesque state beaches. Limited parking means you may have to walk a few residential blocks to access. 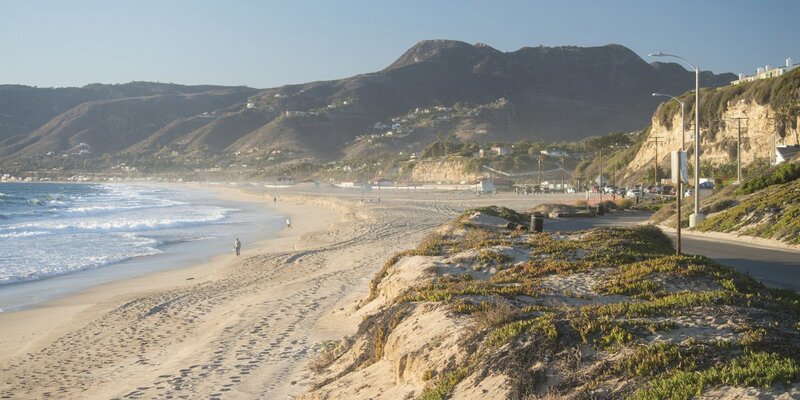 Zuma Beach County Park + Westward Beach: On the west side of Point Dume, this is Malibu's longest stretch of sand, that is popular with surfers, swimmers, and sunbathers. Westward Beach, located on the east end, is slightly more intimate and runs up against Point Dume. Rock climbing above the surf is a possibility at a crag at the far east end. El Matador State Beach: One of three small hidden beaches west of Zuma that is accessed by hiking down a trail from the mesa. Good rock formations. Some tide pooling. La Piedra State Beach: One of three small hidden beaches west of Zuma that is accessed by hiking down a trail from the mesa. El Pescador State Beach: One of three small hidden beaches west of Zuma that is accessed by hiking down a trail from the mesa. Nicholas Canyon County Beach: Sandy beach with picnic areas. Surfing. Opposite the bay from Leo Carrillo State Beach. Leo Carrillo State Beach: Scenic beaches that are part of larger Leo Carrillo State Park. Surfing. Tide pools. Sycamore Cove Beach: Part of Point Magu State Park, this scenic little beach has day use amenities and is patrolled by lifeguards. Goat Buttes in Malibu Creek State Park. Photo by Tyson Gillard. Malibu's parks, which include the state beaches listed above, are what connects the mountains to the sea. Two state parks, Malibu Creek and Leo Carrillo, explores the creeks, canyons and peaks that rise above the coastline. In addition to coastal activities like surfing and diving, Malibu's state parks provide miles of trails for hiking and mountain biking and access some of the area's best rock climbing. Malibu Creek State Park: Located up Malibu Canyon in the Santa Monica Mountains, upstream from Surfrider/Malibu Lagoon State Beach, this unassuming state park is certain to impress. An abundance of hiking and mountain biking trails, a series of rock climbing crags ranging from moderate to difficult, and a swimming hole are all on offer. Camping available. 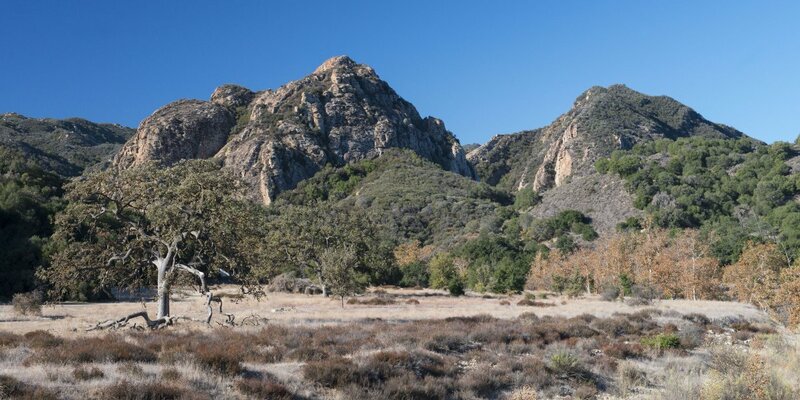 Chaparral Trail Loop: A family-friendly loop extending just over 2 miles in Malibu Creek State Park that affords nice views of the surrounding mountains and explores an adobe ruin. M*A*S*H TV Set Hike: A loop of just more than 4 miles that leads to the original outdoor set for the Emmy-nominated Korean-war-era television show M*A*S*H. Loop accesses swimming hole. Rock Pool Swimming Hole: 1-mile hike to a swimming hole set at the base of towering Goat Buttes. Popular with rock climbers. Leo Carrillo State Park: Located on the western edge of Malibu, Leo Carrillo is best known for it's beaches and surf. Multiple hiking options. Camping available. Nicholas Flat to Willow Creek Loop: 2-mile-long family-friendly loop in Leo Carrillo State Park. Ocean and Channel Island views. Ocean awaits you afterwards. Campsite at Leo Carrillo State Park Campground. Photo by Tyson Gillard. While not extensive in it's camping options, the campgrounds that Malibu does have are well located and very well cared for. Depending on your interests and campground availability, campers can stay either near the surf at Leo Carrillo or up Malibu Canyon in the heart of the Santa Monica Mountains (a 20-minute drive from the ocean). Advanced reservations are recommended, particularly for scoring a site at Leo Carrillo on weekends and during summer months. Malibu Creek State Park Campground: Scenic campground located near Goat Buttes in Malibu Creek State Park. Great selection of hiking trails. Rock climbing and swimming hole also nearby. Leo Carrillo State Park Campground: Surfers will prefer this campground on the western edge of Malibu near the waves of Leo Carrillo and nearby breaks. 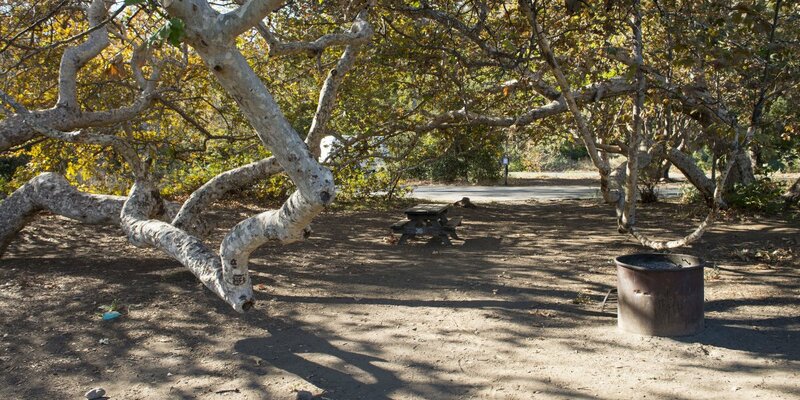 Campground is located in a canyon under the shade of California sycamores. Sycamore Canyon Campground: Close to Sycamore Cove Beach and in Point Magu State Park, Sycamore Canyon Campground has 58 sites along with restrooms and showers.